Ideal vehicle for a couple but also could suit two friends who want separate beds. The Spirit 2 is an ideal vehicle for a couple. With a 2 burner gas stove and a fridge you have the added convenience of your own kitchen. Rear access doors allow you to choose an idyllic place to stop, relax and soak up the stunning scenery that is right on your doorstep. 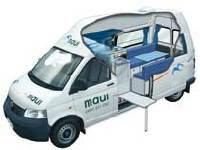 An extra single bed can accommodate a small child, however we recommend this vehicle for two adults.